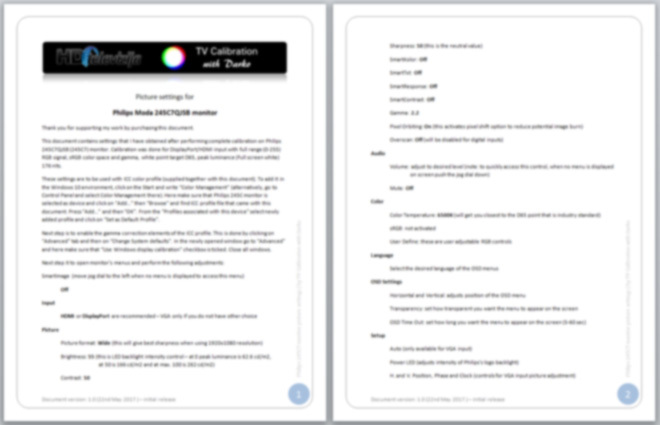 This document contains settings that I have obtained after performing complete calibration on Philips 245C7QJSB (245C7) monitor. Calibration was done for DisplayPort/HDMI input with full range (0-255) RGB signal, sRGB color space and gamma, white point target D65, peak luminance (Full screen white) 176 nits. Tips in this document will give you information about each setting so that you will get an optimum picture. Settings after calibration are for reference only. There is no guarantee that they will give you the best picture which is inline with industry standards and suitable for your viewing environment, especially for greyscale accuracy.